24-year-old Bermudian Sean Stapley is head of business development at the global blockchain consulting firm, MLG BlockChain. Mr. Stapley said, “We’re a global blockchain consulting firm that, at the heart, aims to help spread education and awareness about this transformational technology. Sean fervently believes that blockchain will be beneficial to Bermuda. “Blockchain is a technological force that will impact many industries in the future – it shouldn’t be viewed as something optional to know about, but rather something to embrace. We’re at a stage now it can be compared to the internet in the early 2000s – it’s hard to predict where exactly things will change, but rest assured, they will,” he said. “Bermuda’s flexible and small regulatory body and its status as an overseas international business centre means that it could be a hotbed of blockchain activity if the cards are played right. 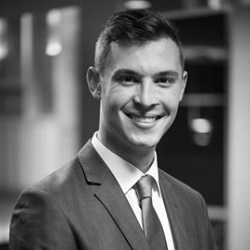 Locally, Sean attended Montessori Academy, Somersfield Academy and BHS before moving to Montreal, Quebec where he graduated from McGill University with a BA in Economics, Finance and International Relations. This young Bermudian is keen to position himself at the forefront of the global shift in technology. When asked what words of encouragement he’d have for other young Bermudians interested in blockchain and other developing fintech markets, Sean said, “Read. Read everything you possibly can and then just get out there. “By encouraging legitimate blockchain companies to settle locally”. So there some illegit ones? I agree with all that you say except it’s a bit of a stretch to say that the OBA got in with MM&I when it was really just two rouge MPs who were allegedly colluding behind the scenes with a certain MP from the other party, and subsequently left the OBA (allegedly citing false reasons for their departure). The two MPs were closer to the PLP by that time than they were the OBA (hence the vote of no confidence). But yes there are many legitimate businesses out there dealing with crypto assets/finetech (e.g. Goldman Sachs).